At the The Art of Style we believe in style over fashion and that every woman needs to have those those “core wardrobe” essentials that will take you from season to season and can be instant “problem solvers.” We also know that items such as these can be hard to find… That is why we decided to create our own. Our first product, a sheer, long sleeve, body top is excellent for layering and giving a sleeve to an outfit when needed! We are proud to say that they are made in Ireland. Made from 100% polyester mesh. This is by nature a delicate fabric and should be treated with care. We recommend a quick handwash and drip dry. Please avoid jewellery with rough surfaces or sharp edges which could damage the fabric. As the name suggests, our Second Skin Body Tops are designed to fit like second skin, they should be snug but not restrictive. Therefore if you are between two sizes, e.g. between 10 and 12, we recommend you go for the 12. 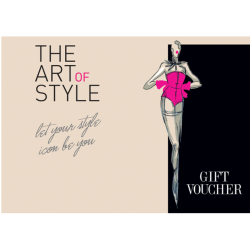 We hope you’ll be completely satisfied with your purchase from The Art of Style. If for some reason you wish to return an item, you have 14 days to do so for a full refund or exchange for a different size. The returned item must be sent to us in the original condition, with tags still on. The cost of returning an item is your responsibility. To arrange a return please email us. Please quote your name, address and order number so we can deal with your return promptly. Please contact us with your name, address, order number and reason for returning. We will then advise you on the best way to proceed with your return.